The Washington National Mall explains the history and significance of each monument and museum. Familiar spots, such as the Washington Monument and the Smithsonian Museums, are all here, as are forgotten landmarks, such as the Fish Commission and the Redwood Tree House. This amply illustrated volume is the first general history of America's greatest urban park, the National Mall. It features more than 100 archival photographs, many never before published, as well as recent photographs of the monuments and museums. A detailed two-page map of the Mall and the surrounding area serves as a handy reference guide for visitors. 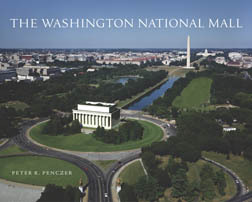 The Washington National Mall is available at Barnes and Noble stores in the Washington area, and at the Washington Monument bookshop, and the Lincoln, Jefferson, and FDR memorials. For bulk purchases of signed copies, contact the author directly. The Washington National Mall is distributed by Washington Book Distributors, Alexandria, Va.